Boat Description Pro Crappie 175 is designed especially for the needs of panfish, crappie and bass enthusiasts, and those who prefer to fish lower in the boat. Its tweaked all over to deliver the ultimate crappie and panfishing experience. 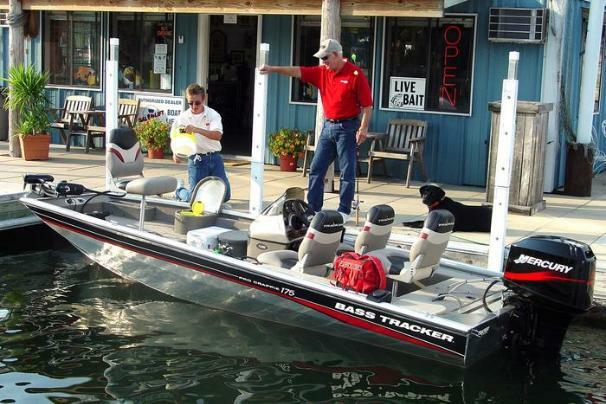 This model features a lower bow deck than most bass boats. Plus two aft fishing-seat bases permit fishing from the floor or elevated position. The most versatile boat on the lake! Exclusive all-welded Revolution hull (with Smooth Ride Guarantee) delivers the smoothest, driest, best handling ride. Package includes Mercury Pro Series outboard, Lowrance X37 fish finder, MotorGuide trolling motor, aerated livewells and baitwells, and custom trailer with EZ lube hubs, GalvaShield protection and swing-away tongue. Dry Weight 894 lb approx.